Congress leader Ajay Maken had raised the issue of "skyrocketing" metro ticket prices. The minimum and maximum metro fares in 2009 were Rs 8 and Rs 30, but they were hiked to Rs 10 and Rs 60. 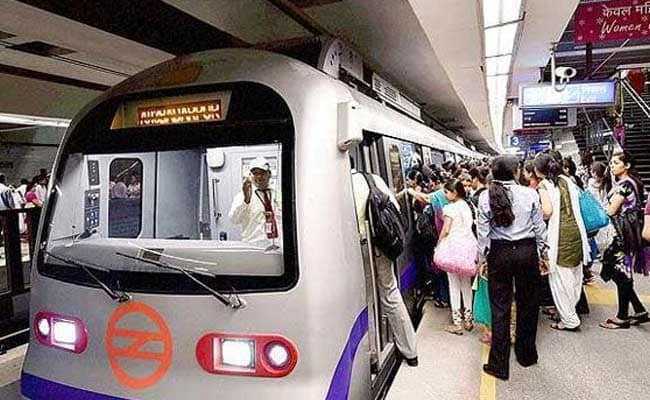 The Delhi High Court Thursday sought response from Aam Aadmi Party (AAP) government and the Delhi Metro Rail Corporation (DMRC) on Congress leader Ajay Maken's plea opposing the rise in fares of Delhi metro and seeking that ticket prices be subsidised. A bench of Chief Justice Rajendra Menon and Justice V K Rao issued notice to AAP and DMRC and asked them to indicate their stand on the plea which alleges that rise in fares from May last year has led to a decrease in ridership by around three lakh commuters. Apart from the issue of "skyrocketing" metro ticket prices raised by Mr Maken, the court sought Delhi government's response regarding construction of multi-level parking for the additional buses that the Delhi Transport Corporation (DTC) intends to procure. Senior advocate Vikas Singh and advocate Aman Panwar, appearing for the Congress leader, told the court that with the last hike in fares in October 2017, Delhi metro has become the second costliest metro service in the world, which has defeated its purpose. In his application, Mr Maken has claimed that with the last hike in fares, Delhi metro earns an average of Rs 7.5 extra from each passenger and with an annual ridership of 100.79 crore, its annual revenue would come to over Rs 755 crore. He has said that if the Delhi government subsidises the amount, it would make the metro more affordable and would reduce the traffic on the city roads as well as the air pollution levels here. The minimum and maximum metro fares in 2009 were Rs 8 and Rs 30, but last year they were hiked to Rs 10 and Rs 60, respectively. The application by Mr Maken was filed in a PIL by Nipun Malhotra, who suffers from a locomotor disability, challenging the Delhi government's decision to procure 1,000 standard floor buses (SFBs) for the national capital. Mr Malhotra, in his plea filed through advocate Jai Dehadrai, has claimed that standard floor buses were not accessible by disabled persons and leads to their exclusion from access to public transport. On the issue of procuring the standard floor buses, the Delhi government told the bench that since the Supreme Court has allowed it to procure 500 SFBs, the high court may consider allowing it to procure the remaining 500. The bench, however, refrained from issuing any such direction without first going through the government's plans on how it intends to make the SFBs as well as the roads and bus stops in the city accessible to the disabled. It directed that an affidavit be filed indicating the government's plan and listed the matter for further hearing on September 27.